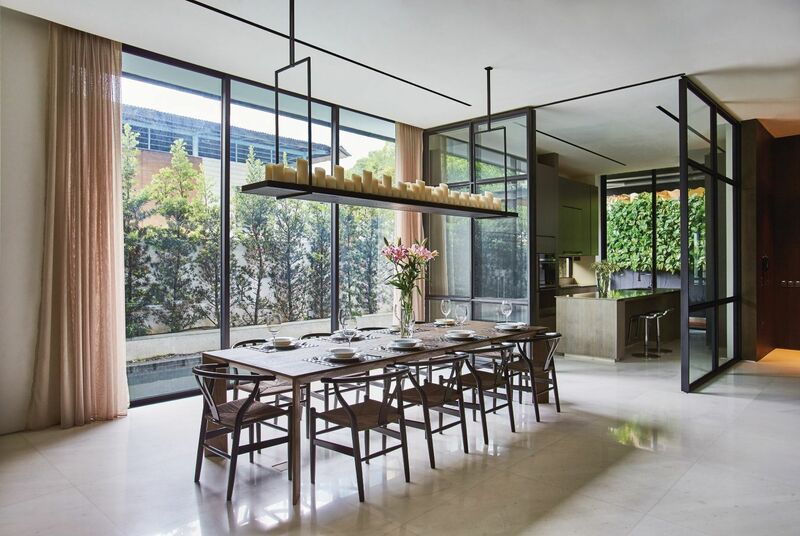 For architect Edmund Ng, working on this Serangoon residence proved to be particularly poignant. In 2013, Ng and his team were hired by the aesthetically driven homeowner Mr Sng, who had terminal cancer. He came to them with a simple wish—to create a beautiful home that his wife, Candy, and their two children, Joycelin and Benjamin, would be able to enjoy after his passing. Despite space constraints, these rooms feel cavernous thanks to their high ceilings, glass walls and notable lack of clutter. Everything that the family might use on a daily basis is hidden behind wooden panels that cleverly conceal ample amounts of storage space. The only decoration on the ground floor is the chandelier, designed by Ng, which hangs above the dining table (as pictured above). Beyond that, there’s no art on the walls, no colour and no superfluous fabrics. “I am very much into the modern style of architecture, as pioneered by Ludwig Mies van der Rohe and Le Corbusier,” says Ng. “It was a response to the overembellishment of the 19th century and for me, it is refreshingly simple.” He adds that it’s the exacting proportions and the lack of unnecessary frivolities that make this less-is-more style so attractive. Throughout the house, there isn’t a single curved wall or an angle that isn’t at 90 degrees. Accessed through a glass door, the living room (as seen above) is a lesson in understated opulence, with its Nero Marquina black marble coffee table beautifully matching the baby grand piano and custom-made furniture. The colour palette and materials of this home are just as restrained: wood, marble, cement, glass, aluminium and steel dominate, and they are in either black, white or their raw state. Only the steel elements have been painted, to avoid rusting; and even the cement blocks that were used to form the external walls have been left bare. The second floor feels more homely: it features Candy’s beloved karaoke room, a gym, and the breathtaking living room. Joycelin and Benjamin’s living quarters are located one floor up, which includes a vast walk-in wardrobe and an adjoining bathroom. A sense of flow is maintained across all the floors through the continuous use of pale blonde wood flooring and off-form cement walls, which are neatly lined with powder-coated steel banisters. Finally, on the top floor is the master bedroom, with its impressive views of the entire neighbourhood. Glass inserts, added to the top of the four walls, heighten the bright and airy aspect of the room. There are no demarcations between the sleeping area and the oversized master bathroom; the result is a feeling of being adrift among the clouds. This story was adapted from Singapore Tatler Homes February-March 2018.